Latte variety with an upright growth and strurdy stems. Excellent productivity, resistant to mildew. Berries are of good size, firm and very tasty. Good resistance to mildew. It is necessary to grow more than one variety to insure good pollination. Latte variety with an upright growth and strurdy stems. Excellent productivity, resistant to mildew. Berries are of very good size, firm and very tasty. Latest variety with an upright growth ( 1,5m). 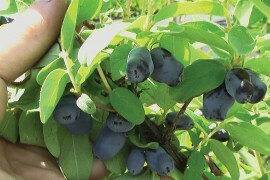 Excellent productivity, with very big berries ( 3-4 gr,), firm and very tasty.